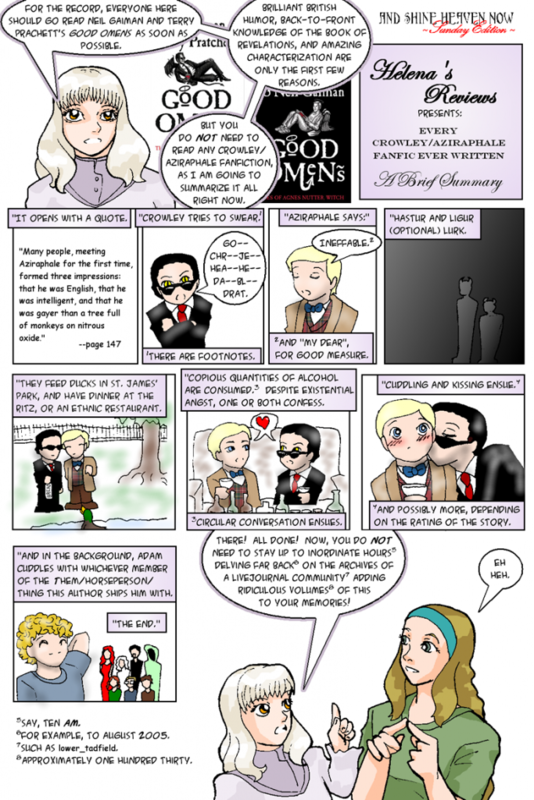 Helena: For the record, everyone here should go read Neil Gaiman and Terry Pratchett’s Good Omens as soon as possible. Brilliant British humor, back-to-front knowledge of the Book of Revelations, and amazing characterization are only the first few reasons. But you do not need to read any Crowley/Aziraphale fanfiction, as I am going to summarize it all right now. It opens with a quote. *And “my dear”, for good measure. Hastur and Ligur (optional) lurk. They feed ducks in St. James’ Park, and have dinner at the Ritz, or an ethnic restaurant. Copious quantities of alcohol are consumed. * Despite existential angst, one or both confess. *And possibly more, depending on the rating of the story. And in the background, Adam cuddles with whichever member of the Them/Horseperson/thing this author ships him with. The end. Helena: There! All done! Now, you do not need to stay up to inordinate hours [say, ten AM] delving far back [for example, to August 2005] on the archives of a Liverjournal community [such as lower_tadfield] adding ridiculous volumes [approximately one hundred thirty] of this to your memories!